Army Comforter Set Just $41.99! Down From $90! PLUS FREE Shipping! You are here: Home / Great Deals / Amazon Deals / Army Comforter Set Just $41.99! Down From $90! PLUS FREE Shipping! Amazon has this Army Comforter Set on sale for just $41.99 down from $89.99 PLUS FREE shipping! 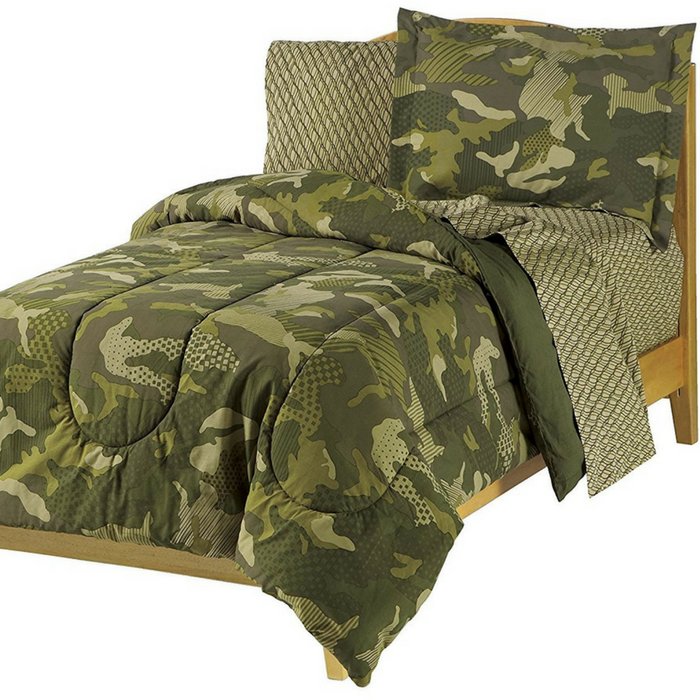 Digitized Camo bedding ensemble for military enthusiasts ages 5 to 45. The face of the comforter and the standard flanged pillow shams features an all over digitized camouflage design in shades of forest green, olive and khaki; the comforter reverses to solid olive green. The 180-thread-count sheets and pillowcases feature an all over geometric design emulating chain link, in shades of olive and forest on a khaki ground. All components are constructed of an easy-care blend of 60% cotton and 40% polyester and are machine washable. This is awesome! Check it out!